The following paragraphs discuss some of the complexities and unique attributes of the competition model that was started at the end of 2003 and finally completed in July 2008. The 2008 Saturn I model is the most complicated project I have ever worked on. I learned a lot of things in the process that may someday lead to other complicated projects in the future. 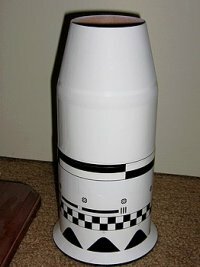 Think about the number of different parts and details of Saturn I’s that make them complex vehicles to model at any scale–and that’s just for a static model that cannot fly. Add to that the weight and logistical constraints of successfully flying a clustered and staged model. Add to that the space requirements of radio control gear. Add to that limited chute space due to RC gear. Add to that a list of several potential designs for the internal structure–none of which are perfect. And that’s just the design phase. Add to that the degree of difficulty in construction and the need for precise fit of major surface details on multi-angled airframe surfaces without using any filler for gaps (because the parts are assembled after painting)… you will begin to picture the complexity of this project. 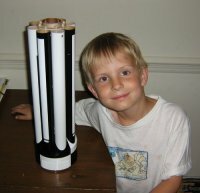 While the boilerplate used a few standard tubes, the competition model employs custom tubing for all but the internal structures (stuffer tubes and motor mounts). 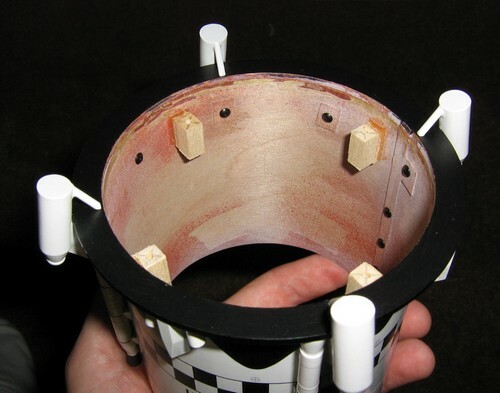 Each of the eight scale booster tanks is made from spiral-wound gummed paper tape just like in the original boilerplate, but coupled with a small section made of cardstock at the base. 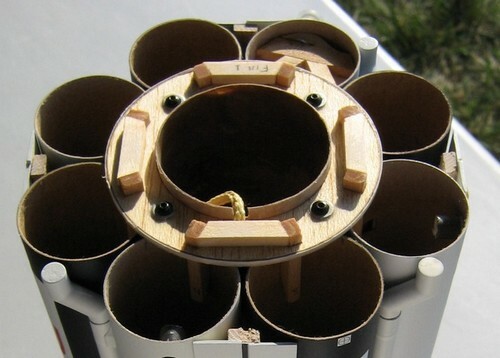 There are four tubes of varying diameter constructed of 1/64″ plywood rolled against the grain. The majority of the nose cone, as well as two other major tapered body sections were also rolled from plywood (I cannot recommend this technique more highly–thanks again to John Pursley and James Duffy for this method. Cast polyurethane parts were used throughout the model. The nose cone tip, fins, and most surface details are resin copies of a custom master pattern. 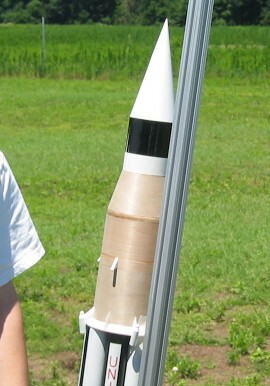 The larger four fins are unique because they were cast with a hollow cardstock core for weight reduction. Thanks to John Pursley for recommending the bolt-together method. This project would not have been successful without the support provided by my teammates. Jess, along with her unending encouragement, poured rubber molds, made castings, sprayed and sanded primer, made all the parachutes used in the test models and competition model. She even designed and built the the transport box that we used to carry the model to NARAM-50. Kevin Johnson encouraged and nagged me until I finished the model. He helped with the pre-flight prep at NARAM-50 by charging batteries, packing chutes, etc… and stayed up late with me one night to help me get the CG correct. Thanks, Kevin!